Back in 1994 I was inspired to work on a large piece of wood. I wanted to incorporate two different ideas: wood carving with a stain finish along with acrylic paint. This work would lead me to the idea for Physical Graffiti, my most detailed and intricate work up to that point. 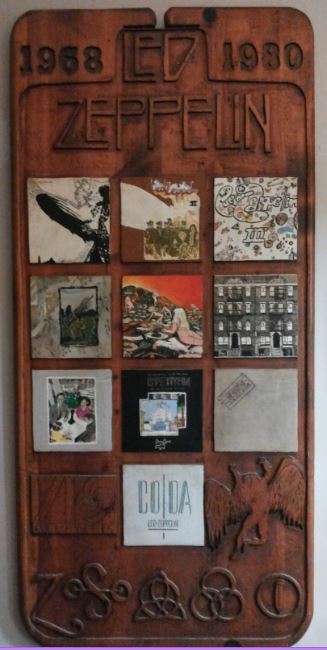 What I came up with was a representation of all Led Zeppelin albums in the center, hand drawn and painted with acrylic. They were pained in order of release. The top and bottom were carved out either by hand or using a router. The years Led Zeppelin played and recorded along with the symbols representing each member of the band. From left to right: Page, Jones, Bonham, and Plant.